Basis Science, makers of the Basis Health Tracker Watch, is reportedly up for sale and has been discussing buyout deals with big-name tech companies like Apple, Google, Samsung and Microsoft. 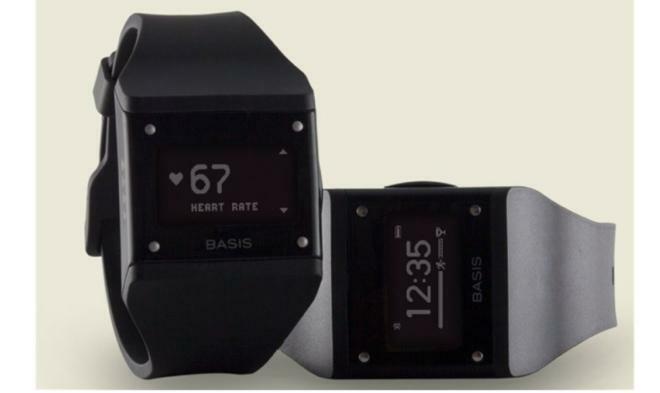 According to sources familiar with the matter, Basis has been actively seeking a buyer for its health tracking smartwatch business over the "past few weeks" and has talked with Apple, Google and possibly others about an acquisition, reports TechCrunch. Basis is supposedly shooting for a "sub-hundred million" dollar price target, which narrows down potential buyers to a select few with deep pockets and serious interest in entering the health tracking device market. Barring a buyout, Basis could go for round C funding, the people said. As for the product itself, the Basis Health Tracker Watch is loaded with sensors to keep track of a user's heart rate, motion, calorie expenditure, sleep cycle and changes in skin temperature and perspiration level. An app manages the raw data and allows for deeper metrics analysis compared to competing devices. Apple is widely rumored to be working on a so-called "iWatch" that some believe will incorporate health-monitoring functions similar to those included in the Basis product. The Cupertino, Calif., company has been on a hiring spree over the past months, snapping up new hires with backgrounds in medical sensors and health technology. Google, too, has been rumored to be eyeing an entry into the wearables sector with its own smartwatch device, though not much is known about the product's specs or capabilities. It has been speculated that the Internet search giant could be angling for an entry into the mobile hardware sector with a Google branded wearable. While Apple and Google were named as front-runners in the reported Basis buy, Samsung and Microsoft may also be interested, sources said. Samsung could be looking to bolster sales of its Galaxy Gear smartwatch, which has seen lackluster sales, while Microsoft's intentions are largely unknown.